A blog of art, science, and literature that explores the question: What is a 'scientific american'? This was published in Argentina, in serial form in the Buenos Aires Newpaper El Nacional beginning in November of 1875. We will release it chapter by chapter on this blog, and eventually on PDF. Rachel Haywood Ferrera provides some excellent background on this story in English, in her book The Emergence of Latin American Science Fiction. We are translating right now from an edition offered in Spanish by the Biblioteca National in Buenos Aires. I feel it, and I understand it, but I understand it and feel it with all the senses of the soul, whose strength develops as I walk away from the center of my prior mortal actions. The night rotates around the Earth, resembling a spoke of a wheel. The continents and the seas are enveloped a moment within the shadow, to appear after, palpitating with life and light. What is the life of the Earth, compared with the life of the spirit in the ether? What is the light over the seas, next to these luminous atoms that sparkle around me, and which are not but many other spirits, members of the universal soul? Its immense whirlwind drags me far from the world in which I have lived; but although I have almost already the gift of omniscience, I ignore completely where the cloud of spirits flies, between whose lights floats mine. Dizzying torrent, its strength alone is computable by the group. My liberty is not yet complete, because I still am not essentially detached from the earthly bonds. The emotional connections are retained dimly, although as I move away, they are now losing their primitive strength, and the moment will arrive in which, completely deprived of them, I feel all the glory of the supreme freedom of the souls. Where are you going, my spirit, dragged by the ethereal whirlwind? I move away...I move away without ceasing. The whirlwind turns, undulates, overflows, fluctuates, and moves away. And with it, the spirits are moved away, fluctuate, overflow, undulate, and turn, to resemble a mist of light dragged by a divine breath. We have crossed the confines of the world, there, where the air ends which is breathed by mortals. And the ether, the space without limits, opens itself to my senses, to my image spirit, already free of earthly affections. And the whirlwind turns, undulates, overflows, fluctuates, and moves away, and with that the spirits move away, fluctuate, overflow, undulate, and turn, appearing as a luminous dust, and animated, propelled to infinity through the voice of eternity. For eight days, I have not had a bite, nor have I drunk a drop of water. with which I trace these lines. The pains of hunger, terrible at first, have yielded the fourth day, and I believe the internal organs are reducing, just as the grain of camphor that gradually evaporates. Matter dies; but the spirit creates wings, and I feel the moment of departure is near. The face sinks at the temples and in the cheeks, the eyes pop out of their sockets, the twitching of the muscles have also disappeared. I look at myself in a mirror and I am horrified. If this is the image with which I am going to present myself to the other spirits, I do not doubt that the spirits will move away, terrified. I feel tetanic shocks..it doesn’t matter...perhaps it is the spirit that produces them as it detaches the image from matter. My family is disconsolate..they want to call a doctor...Fools! They do not know that I am going to enter in direct communication with the universal soul! The terrestrial images are losing their intensity...I only perceive shapes… Ah! The family...top hat, boots, pulse, clock...Doctor! One shape, a doctor, takes me by the hand...His hand is like ice...It makes me shudder! Could his heart be as cold as his hand? Wretch...Why has he not consulted Seele? He looks at me...I hardly make him out. “He is dying” he says in a low voice, and I smile to hear that, because my spirit, which is already recovering its freedom, with the contact of the doctor, increases the intensity of its senses. I smile again, the doctor moves back. Dead! Yes, yes! Wretches, you do not know that it is only now I am alive, and that the spirit and the image, already floating in the ether of the souls, enjoys all the activity of the universal spirit? Dead! You call death the supreme moment of glory? Do you not see my spirit that is elevated? Do you not see it? Do you not recognize the image? There on Earth remains my body, surrounded by those who were my family. Next to the table on which he wrote, the doctor who contributed to liberating my spirit, contemplates with alarm a sheet of paper on which these lines appear spontaneously. It is my subordinate genie who traces them. But the doctor does not perceive the genie. Why? This doctor does not have an image. This doctor does not have a physiognomy. He just expired in horror. His spirit, his image, also floats in the ether of the free souls. (ENG) Chapter 2: The Author consults with a Spiritualist. My youth has been a blur. My spirit had all the vagueness of infinity, and in spite of this, my name is Nic-Nac. In 1856, when I was hardly 20, all of my preoccupations had developed, without having however, ties that bound them, the connecting link with which the years have strengthened them today. The more so as I have resolved serious problems unknown not only by philosophers without senses, but also by sensorial scholars. A spiritualist had just arrived from Europe. Only one person consulted with him and that person who found the ideal of his aspirations in the word of this man, that person was me. There soon existed between us the communion of the soul. However, if vast were his ideas when related with the world of the spirits, more vast still were mine, because they concerned the spirits and all matter, the Kosmos of the pantheists, the supreme dreamer of dreamers. How beautiful is the life of dreams! The dream is the link that binds the human spirit with the grand mysteries of Nature. No one has ever taken a name better given. Many have taken the last name of Torres, [in English: "Towers"] and nevertheless, they are of smaller stature than average. Others flaunt the name León, [in English: "Lion] and I have know some to have fled from a cat. But Seele, or rather, Soul, was as a supreme concession of truth to reality. Here there had no contrast, the shocking contrast between the Torres and the Leónes, because if any time there has existed on the world, a corporeal and tangible soul, it was in the personification of Friedrich Seele. The material life had been sublimated in him, so to speak. Its manifestations transformed into a series of psychic phenomena, analogous to the ones that would be presented by a perceptible and intangible vision at the same time. It was similar to the vision of this black cat that for the last few hours, pursues with its immaterial form the power of my senses. Seele, as his name indicates, was German and in his noble spirit, the full intellectual force of his nation had been concentrated: all the dreams, all the fogs, all the sylphs, all the beauty, and the lights that are born, shine, fly, roam, and color the German spirit. Well versed in all the physical and moral sciences, he was as familiar with the interpretation of a cosmic phenomenon, as the explanation of a physic phenomenon. If to all of this, one adds his powerful strength as a medium, we must admit that Seele could have notable imitators, but never rivals. Seele was a learned man, but still, he was a spirit, and more still, he was a medium. An example: a certain day, a learned man asked him: how many letters does the word carbonado have in Chinese? Consulting with one of his genies, he answered, it has nine letters, just as the word sombrero in English has eight. If the genie limited himself to carbonada, the learned man would have been satisfied, and would have left, recognizing the wisdom of Seele, who had at his service, such knowledgeable genies. However, when the learned man remembered positivism as the affiliation of his ideas, he and his assistants withdrew, treating Seele as a charlatan and the genie as phony. This was later the opinion of the people, but it was well known to me that the people did not have, nor could have, nor must have an opinion. I consulted with the spiritualist, and remained convinced, after the first meeting, that it was impossible to meet a man comparable to this man. “So it is possible to contemplate one of those images without more help than our senses?” I asked him. “And how can you explain, that the spirit being single [NOTE: We are using single instead of simple, perhaps meaning "undivided" in this context] since you have called it atomic, or even better, spiritual atom, may consist of parts with their own force, being that the essential condition of the atom is that it does not have parts? “And is there any means of recognizing when the matter has arrived to become spiritualized completely? “Beforehand, you would have to submit yourself to the same privations. When you felt that your weakness annihilated you, you would observe that the spirit moved away from you, becoming more fixed in its course, the greater the intensity of your desire. Translators' NOTES: This was a really philosophical chapter that had a lot of narrative functions. Its primary narrative function was to explain the technology of space travel to Mars or in Star Trek terms "teleportation". These are ideas the reader will need to know for the upcoming chapters. However, this was also a chapter describing Holmberg's philosophies of scientific knowledge. There was a lot of semantic word play which we interpreted to be texts that opened up questions of indigenous knowledge, of European knowledge, and the mixing and dialogue between European and Argentinean epistemologies. Translating this was really hard and took several meetings to work it out. We hope we did it justice! Nothing is more admirable than the perfect mechanism of the skies. Nothing is more pitious than human ignorance. Endowed with weak senses, if compared to other animals, we claim to have solved the most important questions that can stimulate the spirit in the path of investigation. We can compare ourselves to a traveler who when following a fixed course, suddenly meets a labyrinth of trails: only luck can remove him from a difficult trance; a mariner who in the ocean loses his instruments, leaving his ship to float like a leaf that the wind blows. So the philosophers, completely lacking in the final elements of the research, concentrate their spirit and appear to explain the phenomena of the universe by any whim of their imagination, as if they were to solve an abstract question, the only case in which such concentration is permitted. The person is not any different who closes and tightens both eyes, seeking to examine a weak organism in a microscope, an instrument which perhaps he didn’t even know by name. But it is necessary to break with such an old system, to liberate the spirit of material weight, and substantially raise it to those regions that can perhaps serve to resolve the most difficult points of the universe. 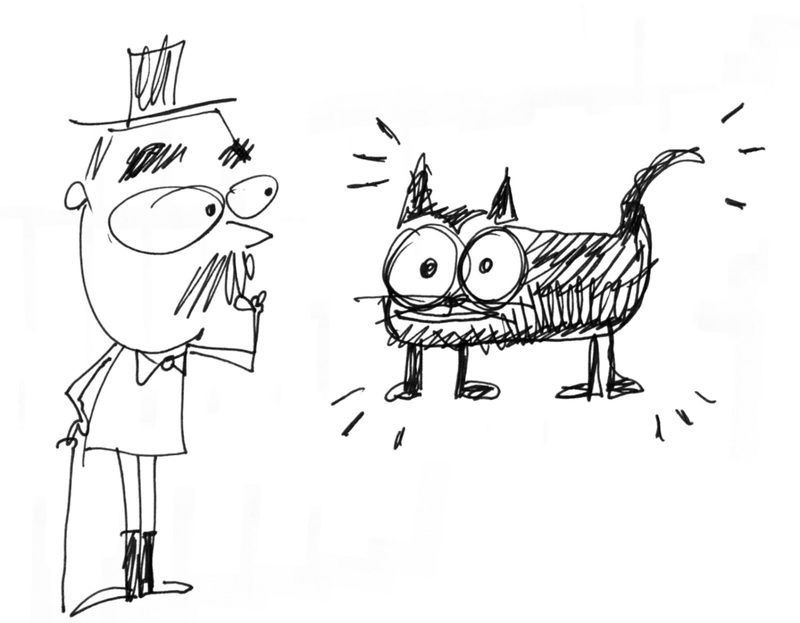 A black cat is presented to my eyes and I watch it. This cat is real under the viewpoint of primary research, but this cat is not substantial, because it lacks many of the essential conditions. This cat appears virtually; it is neither a reflection nor a shadow, but it is a cat. I see it, and although I can't feel it, it is possible to assure that its nature is comprehensible. Who can deny that by virtue of unknown forces, it could be possible to undertake extraordinary travels, as would be in the case of this cat, whose body and spirit being found is perhaps two hundred leagues of distance, comes to impress me with its real image, yes, real, though it is not matter? This is not, surely, a simple phenomena of the spirit. Simply imitate this cat , and all doubts are vanquished. The image is not material, all the same, it is perceptible. A mirror reflects a figure, returns it with all its elements... and this image is not a spirit either. Could it perhaps be given the name of spirtual matters? When the spirit jumps daringly to interpret certain mysteries, it recedes at the immensity of the attempt with the paucity of the elements that are at its disposal; tied to the dominion of the senses, the senses do not go on beyond its power. But if the spirit accompanies the image: if the latter conserves the sensory force, free, in turn, of matter, is it not possible to penetrate the world of the unknown and interpret the universe? Millions and millions of luminaries sparkle in the space. Science baptizes them, calculates their distances, observes their beams, breaks down the elements of their light, numbers them, and archives them in its libraries. And life? Are these perhaps splendid deserts launched in space for man to contemplate? No, life palpitates in each of those grains of sand in the shining beach of the sky, and those marvels that the spirit can not understand alone, are going to be resolved by the spirit and the image. Translater's note: In this chapter, we took the word "materia" and used the English "matter". 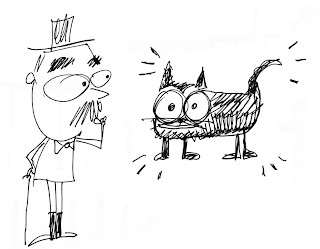 We also noticed Holmberg's interest and fascination with the images of Edgar Allen Poe, as signified by the black cat. (ENG) Nic-Nac.. beginning a new translation. Ana and I are about to take on a very large task..to translate into English Eduardo Holmberg's novela, Viaje maravilloso del señor Nic-Nac al Planeta Marte. This was published in Argentina, in serial form in the Buenos Aires Newpaper El Nacional beginning in November of 1875. We will release it chapter by chapter on this blog, and eventually on PDF. Rachel Haywood Ferrera provides some excellent background on this story in English, in her book The Emergence of Latin American Science Fiction. We are translating right now from an edition offered in Spanish by the Biblioteca National in Buenos Aires. Currently Anexia Editions in Argentina is doing a graphic novel of this tale in Spanish. They have completed part 1 and are working on part 2. "Yes" said the lawyer Rhode. “I had that case. It is a situation, quite rare for here, of vampirism. Rogelio Castelar, a man until then normal outside of some fantasies, was discovered one night in the cemetery as he dragged the recently buried body of a woman. The individual's hands were destroyed because he had recently removed one cubic meter of the earth with his fingernails. In the side of the grave lay the remains of the coffin, newly burnt. And as a macabre complement, a cat, no doubt an outsider, lay thereby with broken kidneys. As you can see, nothing lacked in the scene. "To you I will say everything! Yes! You mean what was that like, about the...the cat? I! Only I! Listen to me: When I arrived..there, my wife..."
"Where THERE?" I interrupted him. Not even one of them was combed because the wind threw all of their hair to the side. And the eyes from outside looking at me. And all of us ran. Everyone ran with a silent fury to the rubble. The bricks flew, the framework swayed, the removal advanced, leaping. At 4:00, only I worked. I did not have a healthy nail, nor in my fingers was there anything else to dig. But in my chest! Anguish and fury and horrid misfortune trembling in my chest in looking for my María! Nothing remained but the piano to remove. There was an epidemic silence, a fallen petticoat, and dead rats. Under the lying piano, on the granite floor of blood and charcoal, was the crushed servant. I took her out to the patio, where nothing remained but four silent walls, viscous with tar and water. The slippery floor reflected the dark sky. Then I took the servant and began to drag her around of the patio. They were mine, these steps. And what steps! A step, another step, another step! In the hollow of a door..charcoal and water, nothing more- was huddled the cat of the house, who had escaped the disaster, although battered. The fourth time that the servant and I passed in front of her, the cat howled in anger. The sixth time that we passed in front of the cat, the animal bristled. The seventh time, it rose, dragging its feet behind it. And it followed us then so, striving to wet its tongue on the oiled hair of the servant - of her, of María, no damned corpse stealer. The vampire flattened his own hair while he looked at me with his immense crazy eyes.